Orlando, FL, USA – On May 23 and 24, visitors to SeaWorld Orlando had the unique opportunity to watch world-renowned marine artist and conservationist Guy Harvey paint a signature mural in the park’s new realm, Shark Wreck Reef. The 16-foot by 24-foot original artwork, featuring a Mako shark, joined only a handful of murals created by the celebrated artist and will be a focal point in the heart of SeaWorld’s Orlando park. 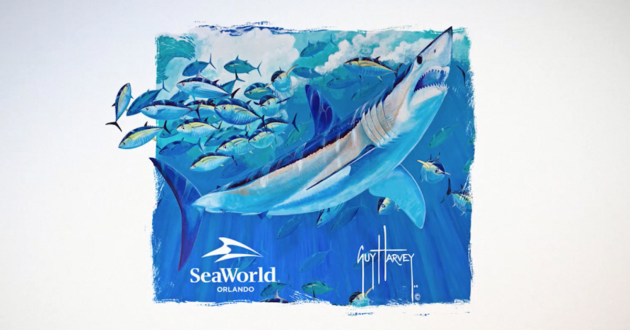 Guy Harvey, perhaps best known for his wildly popular t-shirts depicting offshore and nearshore marine life, has also commissioned an array of exclusive paintings and apparel, which will be available only at SeaWorld. SeaWorld will donate a portion of the proceeds from the sale of such items directly to the Guy Harvey Ocean Foundation. In April, SeaWorld Parks & Entertainment (SEA) and Guy Harvey announced a new partnership focused on ocean health and the plight of sharks in the wild. The two organizations will partner to raise awareness of these important issues, and collaborate on science and research to increase understanding of how to better protect these critical predators and their habitats. In addition to the science and research efforts, Guy Harvey and SeaWorld will also work together to increase public awareness about ocean health and the need for shark conservation. SeaWorld’s new roller coaster, Mako, will be a major platform for this effort. In the queue lines for the new coaster, guests will be educated and entertained through digital platforms that provide access to the real science of sharks in the wild and ways they can help protect them with Guy Harvey as the host. Elsewhere in the realm guests will have access to real-time shark tracking and videos from Guy Harvey’s vast library of compelling and visually stunning shark expeditions. Interactive materials will also share information about shark conservation and ways to get involved.